Planters filled with plants & flowers add a welcoming splash of color to just about any setting. Sturdy heavy weighted concrete planters such as these also provide bollard like security to entrances and pathways. Steel reinforced concrete construction results in a planter with a natural resistance to vandalism and theft. The cast-in drain holes help ensure a healthy substratum, an essential element for vegetation to flourish. 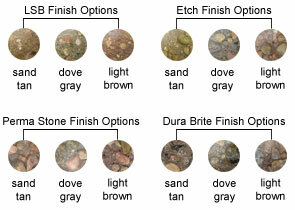 Available in the color and finish options as shown. Complete the whole look with an optional concrete under footing Planter Pad, great for added stabilization. Variety of sizes, color and finish options are available to match up with just about any choice of planter. 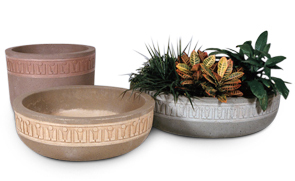 RP Series Concrete Planters | 24"Dia. Optional Accessories | Planter Pad 24"Dia. RP Series Concrete Planters | 30"Dia. Optional Accessories | Planter Pad 30"Dia. RP Series Concrete Planters | 36"Dia. Optional Accessories | Planter Pad 36"Dia. RP Series Concrete Planters | 48"Dia. Optional Accessories | Planter Pad 48"Dia. RP Series Concrete Planters | 60"Dia. Optional Accessories | Planter Pad 60"Dia. RP Series Concrete Planters | 72"Dia. RP Series Concrete Planters | 84"Dia.